From the moment you arrive to the moment you leave, the camping Yelloh! 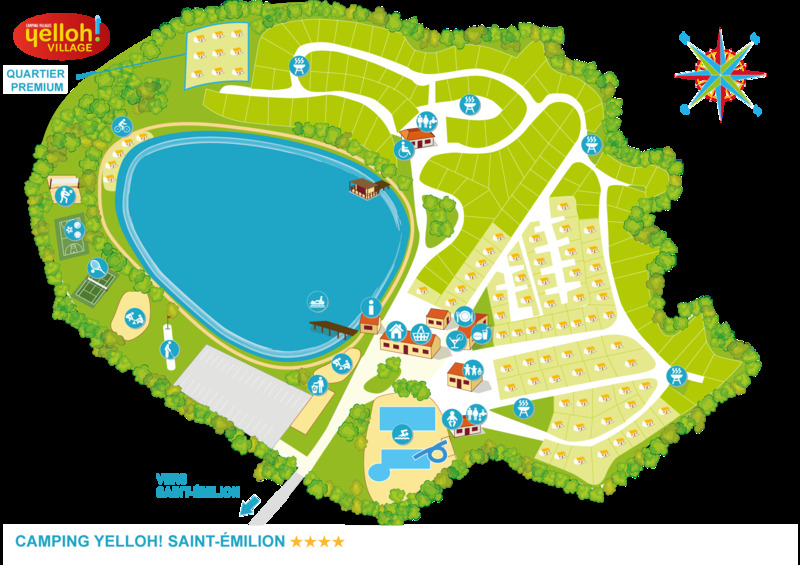 Village Saint Emilion has thought of everything to ensure your holiday will be totally unforgettable! Reception, shops, restaurant, equipment hire, help and advice... The services available in the village make life easier and your holiday even more relaxing! Les Amis du Terroir restaurant serves food from 6pm every day, with the emphasis on fine local produce and regional specialities. Simple, traditional cooking means your taste buds will be in for a treat with the menus put together every day as well as the à la carte dishes. Les Amis du Terroir has remembered your kids too, with menus that have been put together specially with them in mind. So all that's left for you to do is sit back on the terrace on the Village Square and relish it all! Unless you'd rather be eating one of their delicious pizzas beside the lake? It's up to you! Take life easy when on holiday at camping Yelloh! Village Saint Emilion, whilst keeping costs firmly under control! Choose the half-board option, designed to meet the needs of all the family. Your half-board package must be booked before you arrive. For a cooling break, come and enjoy a glass of something nice with your friends on the terrace of the campsite bar on the village square. You could make the most of it, too, by trying one of the region's quality wines with a nice plate of cold meats and cheese, then carry on playing pétanque, as the boulodrome adjoins the bar! Pretty good eh? And don't forget happy hour every evening between 6 and 7pm, which is sure to make for a nice time to enjoy together! For those who enjoy a glass of wine, there is a wide selection of Saint Emilion and Saint Emilion Grand Cru, at very affordable prices. Take home a taste of your holiday and restock your cellar. Simply place your order and we will have the boxes ready on the day you leave. Our team at reception is ready to welcome you every day from 9 am to 8 pm with a listening ear and the answers to your questions! Whether you are looking for tourist information or advice on the best places to visit, preferential prices with the campsite's partners or a convenient rental service (sheets, towels, baby kit and bath...) we're here to make your holiday as comfortable as possible! On site you will also find a laundry and a service area for campervans at the campsite entrance. Twice a day, a free shuttle bus is available take you to the centre of the village of Saint-Emilion. For those who love shopping and all the colour of the local market, Libourne is only 12 km from the campsite.